It’s no secret that we LOVE tofu! It’s one of our favourite ingredients. To date, we’ve posted over 40 tofu recipes to ilovevegan.com. Most of the time I use extra-firm tofu in my recipes. It’s nice and firm with a dense texture. It’s great for marinating, crumbling or slicing, and baking, frying, or grilling. It’s flavour is delicate and mild, so it’s perfect for soaking up any flavour. Extra-firm tofu is absolutely perfect for making this dairy-free ricotta. You can use this tofu basil “ricotta” for lasagnas, pizzas, and stuffed pastas like these jumbo shells. Before adding the marinara sauce to the baking dish, add 1 cup of vegan “ground beef”. Top with marinara sauce and stuffed shells. Continue with the recipe as directed. 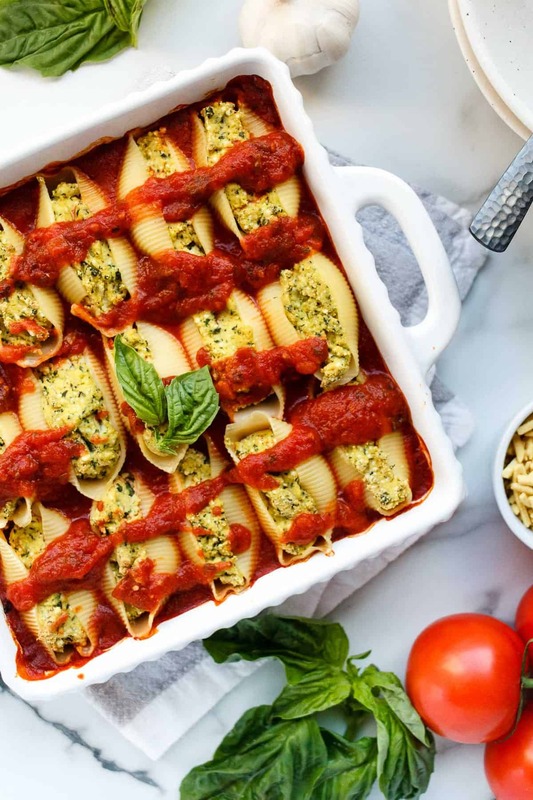 Top the stuffed shells with vegan cheese shreds before baking. This dairy-free basil "ricotta" is perfect for making lasagnas, pizzas, and stuffed pastas like these jumbo shells. This simple recipe uses jarred marinara sauce but you can make your own pasta sauce too! In a food processor, combine extra-firm tofu, mozzarella, nutritional yeast, basil, olive oil, lemon juice, salt, garlic powder, and black pepper. Pulse, pausing to scrape down the sides of the processor as needed, until the mixture is almost smooth and the basil is chopped and evenly distributed. Do not overprocess, the tofu should still have a slightly grainy texture. Cook jumbo pasta shells according to instructions. Pour 2 cups of marinara sauce into the bottom of a 9” x 9” casserole dish. Fill cooked jumbo pasta shells with tofu ricotta. Place stuffed shells on top of marinara sauce.Optional: Spoon shells with extra marinara sauce and vegan cheese shreds. Cover with foil and bake for 20 minutes. Uncover and bake for another 10 minutes. Perfect! I love it in lasagna too! These look incredible and pretty easy to whip up with your product suggestions. Hurray for pasta, with flavor, and…its vegan. Thank you so much Cheryl! Happy Holidays!